The first set of photos here is from a current rat room set-up. My rats have been practicing with boxes and bins, for climbing and balancing, since they were babies. I trained them gradually to build up their muscles and balancing and jumping skills. 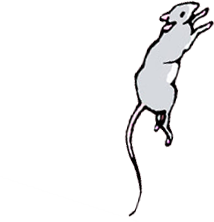 Please do not put objects in a room for rats to play on if the rats aren't physically fit to keep themselves safe. I would consider this current set up to be ideal for very fit and skilled rats only. Also: 100% human supervision is required. This is not an environment in which rats can be left unattended, both for the safety of the rats and because I'm pretty sure rats will try escaping promptly if their human is outside, nearby, far away, or not supervising. Please keep your rats safe! 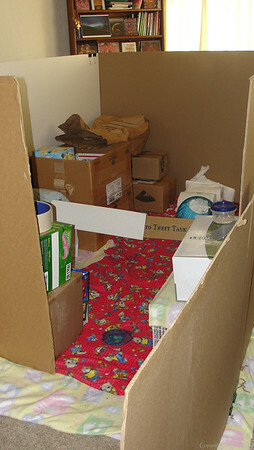 This first set of photos shows details for how the room was constructed. At the end of this gallery of photos are another set of photos of the room when it was first constructed, plus the baby rats doing some early exploring. IMPORTANT: 100% human supervision is required. There is no guarantee here that your rats would be happy inside and not try to escape or gnaw their way out.